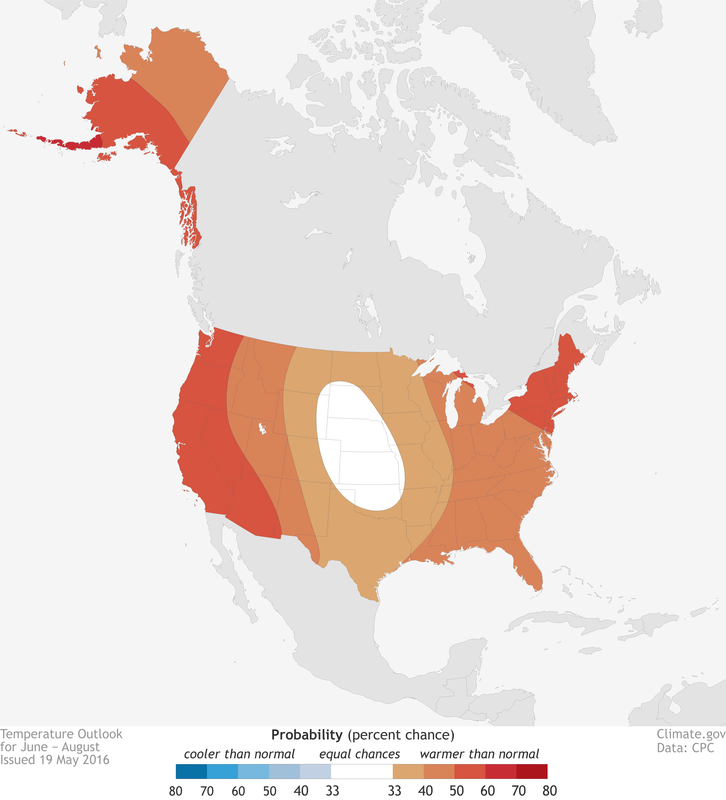 NOAA’s seasonal forecasts start with the assumption that for any random summer or winter, there are three possible climate outcomes–temperature or precipitation that is well above normal (upper third of the climatological record), near normal (middle third), or below normal (lower third)–and they are each equally likely. Together, all probabilities must add up to 100%, so the “default” probability for each outcome is 33.3%. The goal of the forecast is to estimate how the actual conditions in the weeks or months before the season–like the presence of El Niño–tilt the odds toward or away from “equal chances” for all categories. If models predict that the chances of well above average temperatures are 60%, then the chances for the other two outcomes (near-average and well below average temperatures) must be split between the remaining 40% (100-60=40).